It was only upon his death in 1919 that the painting finally found its way into a museum: Von Tschudi’s wife donated the work to the Neue Staatsgalerie in Munich, where the couple had relocated. But just 20 years later the portrait was moved again, this time by the Nazis. "It was really about putting forward one version of a culture and eliminating everything that resisted it. There were works that were put into degenerate art shows, some into markets, and some were deliberately destroyed in bonfires," says Sarah Kianovsky, a curator of modern and contemporary art at the Harvard Art Museums. Along with the works of many artists who strayed from strict naturalistic representation, Van Gogh’s paintings were branded by the German government as “degenerate art” and suppressed by the fascists, Kianovsky explains. “It was really about putting forward one version of a culture and eliminating everything that resisted it. There were works that were put into degenerate art shows, some into markets, and some were deliberately destroyed in bonfires.” The Nazis’ targeting of “degenerate art” brought tumult to the art world: Works were removed from public museums, stolen from victims of the Holocaust, and looted from foreign art institutions as the Wehrmacht pushed outwards, she notes. “Self-Portrait Dedicated to Paul Gauguin” did not escape the Nazis’ notice. Though records differ about the exact year of its seizure—varying documents in the Harvard Art Museums’ object file cite 1937 and 1938—by 1939 the painting had been transported to Lucerne to be sold at a Nazi-run auction. As a fundraising endeavor, the auction was not a rousing success; many paintings were not sold, and a number that did went for as little as £20 or £30, according to the sale catalog (roughly $1,500-$1,600 in modern dollars). The Van Gogh sold for £12,000—enough of a surprise for the auctioneer to annotate the catalog with an exclamation mark. If this figure seems high compared to the other lots at auction, a comparable self-portrait by Van Gogh was purchased in 1998 for $103.8 million, making it the most expensive self-portrait ever sold. The circumstances surrounding the auction were controversial even at the time; some collectors refused to attend. But, according to documents in the Harvard Art Museums’ object file for the self-portrait, this was not a concern shared by Wertheim, whose proxy, Alfred Frankfurter, purchased the Van Gogh. “Wertheim seemed to believe that to support what the Nazis detested was justifiable,” the file says. Van Gogh's "Self-Portrait Dedicated to Paul Gauguin" in the Harvard Art Museums. Recent years have seen increasing efforts to track down and return works that were stolen by the Nazis. “In the late ’90s, [a] government conference was convened in Washington, D.C., and this conference was about how to deal with Nazi looted art. And the result of this was the Washington Declaration,” Jutta von Falkenhausen, a German lawyer who specializes in restitution, told The Crimson for a February 2014 article on the Allies’ efforts to retrieve art stolen by the Nazis. “[The signatories] undertook whatever [was] in their power to search for looted art and find a just, fair solution—which often means restitution.” Kianovsky herself was part of an effort to investigate and clarify the provenance of several pieces in the Harvard Art Museums that had unclear origins, including works donated by Wertheim and Pulitzer. But while much art that traded hands during this period has been the subject of restitution claims, “Self-Portrait Dedicated to Paul Gauguin” has not. “State paintings are not subject to restitution claims,” Kianovsky says. Though works that were taken from private owners or looted from foreign museums must be returned, she explains, the Van Gogh was removed by the government from a government-owned institution. Therefore, the subsequent sale was legal. Matisse’s “Bathers with a Turtle,” which originated from the Folkwang Museum in Essen, is in a similar situation. "Leaving the collections in the state after 1945 means furthermore to demonstrate the historical situation after the Nazi regime," says Tina Nehler, a spokesperson from the Neue Pinakothek, Munich. What’s more, the museum in which the self-portrait once hung no longer exists—the building that housed the Neue Staatsgalerie is now the Staatliche Antikensammlungen, a museum of antiquities. Kianovsky says that the Bavarian State Paintings Collections, under the purview of which the Van Gogh would have fallen while in Munich, has never asked for the paintings back, a fact that representatives from the Collections confirm. According to Tine Nehler, who works at the Neue Pinakothek, another Munich-based museum where much of the Neue Staatsgalerie’s previous collection is now housed, this is very much a deliberate choice. “Almost every European museum has paintings from other collections [that] might [have] belong[ed] to other museums before World War II,” she wrote in an emailed statement. Reverting to pre-war conditions, she said, would be a gargantuan undertaking. “Leaving the collections in the state after 1945 means furthermore to demonstrate the historical situation after the Nazi regime.” Van Gogh’s self-portrait did make its way back to Munich once since it was removed, participating in a temporary exhibition at the Neue Pinakothek in 1997. In yet another twist, the painting’s seizure may be precisely the reason why it still exists today. As the war intensified, the Neue Staatsgalerie was forced to shut its doors. For safety, a large portion of the museum’s collection was transported either to store houses outside the city or to other museums, but a number of works were stored in the building’s cellar. An Allied bombing raid severely damaged the structure; many works inside were destroyed. "It is a great picture. 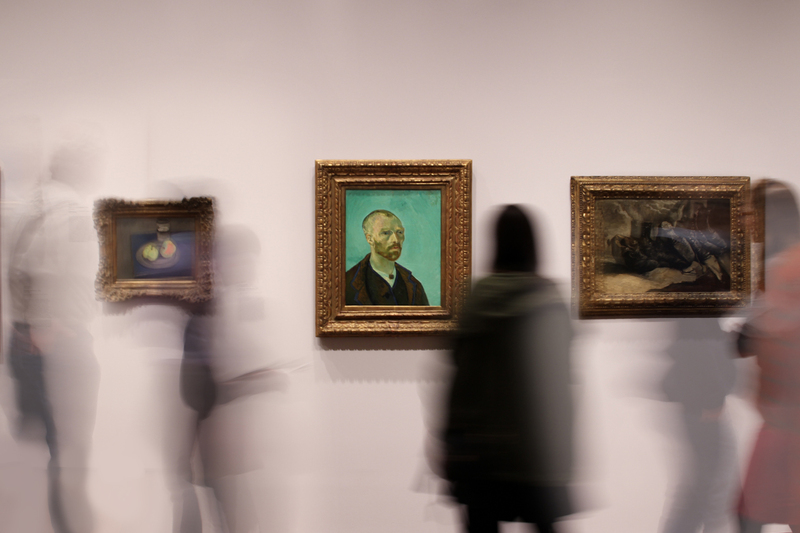 It might even be [Van Gogh's] most famous self-portrait, so we are very lucky to have it here," says Henri Zerner, a professor of modern art in the History of Art and Architecture Department. Seventy-six years since the auction in Lucerne, Van Gogh’s “Self-Portrait Dedicated to Paul Gauguin” is now one of the most iconic works of the Harvard Art Museums’ collections. With its luminous green background, it has a tendency to arrest the gaze of even the most casual visitor, demanding more prolonged attention. It is a fate that in all likelihood Van Gogh never imagined for what he had intended to be a gift for a friend. Scarcely two years after he completed the work, Van Gogh was again seized by the depression that had destroyed his dreams of founding a long-term artistic commune with Gauguin. Wading out into a field of wheat, Van Gogh shot himself through the chest. Though the wound itself was not enough to kill, the attendant infection proved fatal. He died in his brother’s arms. “It is a great picture,” Zerner says. “It might even be [Van Gogh’s] most famous self-portrait, so we are very lucky to have it here.” From an artist’s collective in Arles to Gauguin’s Paris studio, from an art dealer in Berlin to a state museum in Munich, from an auction of “degenerate art” to pride of place on the walls of the Harvard Art Museums: This painting, there is no doubt, has had quite a journey. —Staff writer Erica X Eisen can be reached at erica.eisen@thecrimson.com.